Grains, protein, and veggies all in one dish. Serve for breakfast, lunch, or dinner. *Note- I typically eyeball ingredients, so measurements in instructions might be a little off. Set oven to 400 degrees F. Place salmon in a zip lock bag. In a small bowl, combine and whisk together tamari, honey, olive oil, garlic powder, salt and pepper. Pour the sauce into the bag with the fish and let the salmon marinate for at 10 minutes. Save any remaining sauce. Toss broccoli and the whites of the onions in a large bowl with remaining sauce. Add salt and pepper, plus some extra olive oil if necessary so that broccoli is evenly coated. Line a baking sheet with tin foil. Place the salmon and vegetables on the baking sheet and cook in the oven for 15-20 minutes, depending on the thickness of the salmon. Slice cucumbers. In a small skillet, scramble the eggs. Remove eggs and put in a serving dish along with some sushi rice and the cucumbers. Add the salmon and broccoli when they’ve finished cooking. Sprinkle with the green tops of the onions and sesame seeds. Enjoy! It’s always a treat to come across an unrecognizable fruit or vegetable at the farmers market. The last time I was out I spotted these small, ginger-like nubs I had never seen. 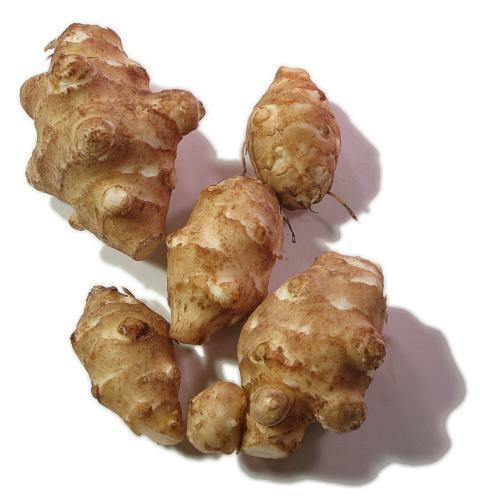 Those little nubs turned out to be sunchokes, which are also called Jerusalem Artichokes. I’m not sure how common sunchokes are, but I highly recommend experimenting with them if you can find them. Preheat oven to 400 degrees F. Toast garlic cloves in the oven for 5 minutes. Remove. Heat olive oil over medium-high heat in large pot. When hot, add the sunchokes, potato, onion, crushed red pepper flakes, nutmeg, salt, and pepper. Saute about 10 minutes, stirring occasionally until vegetables are lightly browned and softened. Add the garlic. Add the water or broth, more salt, and bring to a boil. Once boiling, reduce heat to a simmer and cook for 30 minutes minimum. I prefer to keep it cooking for a few hours for an extra flavorful soup. Process the soup in a blender or with an immersion blender either until smooth or almost smooth, depending on whether you like some chunks of veggies. Check for seasoning and serve. Heat oven to 425 degrees F. Mix broccoli di Ciccio in a large salad bowl with the seeds, almonds, cheese, lemon, remaining olive oil, garlic, salt, and pepper. Toss and put in the fridge covered. Line a baking sheet with tin foil. In a bowl, mix sunchokes with about 1 tbsp olive oil, salt, and pepper. Roast for 15-20 minutes. Remove salad from the fridge and combine with the sunchokes. Serve. Looking for an easy vegetarian recipe or an alternative to boring ole’ white or brown rice? I’ve recently discovered Forbidden Rice, an exotic and somewhat pretentious name for black rice, and I highly recommend trying it. I first had it at a Los Angeles restaurant called Flower Child. It was so good that when I got home I immediately tried to recreate the recipe. There are a few reasons why I’m loving this rice. Not only does it come out with a risotto-like texture, but the grains contain an extraordinary amount of anthocyanin, the powerful antioxidant responsible for giving certain foods like blueberries or eggplants their beautiful purple color (source: Modern Farmer). 1- Add rinsed rice to a small pot with 2 cups water, the boullion cube and ghee (optional). *Note- I barely salt the water since the boullion contains salt. Cook over high heat on the stove until boiling, then cover and reduce heat to low for about 20 mintues or until cooked through. Remove from heat and leave lid on. 2- While the rice cooks, heat a medium-sized pan over medium high heat. Add sesame to the pan. Add the carrots and broccoli first. Season lightly with salt and pepper and cook for about five minutes or until slightly soft. Next, add the zucchini, onion, and garlic. Lightly season again with salt and pepper and add the chili flakes. Add more sesame oil if necessary. Cook about 5-6 minutes, or until everything is softened. Turn heat to low. 3- Add the cooked rice to the pan of vegetables and toss to thoroughly combine everything. Serve and enjoy this healthy meal! Probably five years ago or so, I don’t believe I had ever heard of kale. It seems like the green, leafy vegetable blew up to celebrity status overnight, suddenly becoming the most talked about superfood. This vegetable has become one of my personal favorites and with any vegetable, if you know how to prepare it right, it can be delicious. Buying vegetables, whether it’s kale or other green vegetables like cabbage, broccoli, spinach, etc, is cost effective and leaves less of a carbon footprint. While animal agriculture has many implications like land degradation and reduction of biodiversity, vegetables have a very low environmental impact and be grown in most climates. Dark leafy greens are an important source in reducing inflammation in the body. Vitamin A, selenium, and beta-cryptoxanthin are some of the few anti-inflammatory agents found in vegetables. Our ancestors had way more fiber in their diets than we do today. Fruits and vegetables are a fantastic source of fiber, especially kale, broccoli, carrots, asparagus, Brussels sprouts, and avocado. Fiber maintains bowel regularity and prevents the risk of health problems. Some people believe that it’s difficult to get healthy amounts of iron in our diet if a person doesn’t eat meat. This simply isn’t true. In actuality, some vegetables contain higher levels of iron than animals foods, especially vegetables like Swiss chard, soybeans, lentils, spinach, and turnip greens. Milk is believed by many to be the greatest source of calcium, however, vegetables have high calcium amounts that’ll keep our bodies strong. That being said, don’t rely solely on vegetables as a source of calcium, because it’s harder for our bodies to absorb calcium from vegetables. Kale, collards, cabbage, arugula, and bok choy are some examples of vegetables containing lots of calcium. As I’ve written about before, getting healthy fats in our diet is very important, and there is a distinction between good and bad fat. Omega fatty acids are necessary to our diet. Lots of people take fish oil capsules, but kale actually contains both omega-3 fatty acids and omega-6 fatty acids. There should be an easy way to know what kinds of fruits and vegetables to eat daily to get the healthful benefits we need. Luckily, there is an easy way. Just remember, eat a rainbow every day. When we eat a rainbow of fruits and vegetables we get the vitamins and minerals we need to live healthy lives. Fruits and vegetables contain one of three main types of pigment: carotenoids, which give orange and yellow vegetables their colors; flavonoids, which provide blue, red and cream colors; and chlorophyll, which makes greens green. Red- A lycopene, a carotenoid, is a powerful antioxidant that has been associated with a reduced risk of some cancers, especially prostate cancer, and protection against heart attacks. Yellow/Orange: High in beta-carotene, which is particularly good antioxidants. Green: Green vegetables are excellent sources of vitamin K, folic acid, potassium, as well as carotenoids and omega-3 fatty acids. Blue/Purple: Rich in anthocyanins, which give these fruits their distinctive colors, may help ward off heart disease by preventing clot formation. They may also help lower risk of cancer. If you have kids who are having trouble eating their fruits and vegetables, one suggestion would be to create a chart together (as seen above), where your kid can write in what foods he or she ate that day under each color of the rainbow. If you have the time and space, you could also plant a “rainbow garden” together. Get creative!